Welcome to Down On The Street, where we admire old vehicles found parked on the streets of the City That Rust Sorta Ignored: Denver, Colorado. 55 years old and still at work! 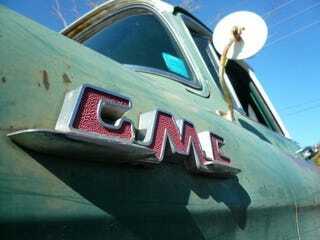 Actually, this truck might be a '56 model; there's not much visible difference between the 1955 and 1956 GMC half-tons. Either way, it's still being used to haul construction supplies around.